I just came back from Singapore last night, having spent a few days at a conference there, engaged in some PR work for the university I am employed by and writing a newsletter. I used Pages . . . but that is another story. Being in Singapore was the perfect opportunity for me to purchase my overdue iPad. I had wanted one, of course, from the moment they were announced, not only because of the way the concept had been implemented, but the idea that if I am to write a column on Apple, Macs and related technology. I also have the latest iPhone 4 and saved for that carefully. As soon as it arrived in Bangkok, I was there with my credit card in hand and the transaction was done in 15 minutes. My Singapore iPad was not to be as someone organising our visit forgot to sign some papers, so the hotel froze the full cost (room plus mini-bar) and when I asked for a 32G iPad at the shop, I was embarrassed when my credit card declined to cough up the necessary cash equivalent. This was doubly frustrating as I wanted to display the newsletter on a medium that was almost custom made for such events, while putting it on the iPhone, impressive as the header might look, the text is too small unless we focus, zoom, or play other tricks that iPhone owners use to read successfully such texts on the device. I have read a few books and a number of PDFs with a little effort (e-books are easier I feel): I await my iPad still. 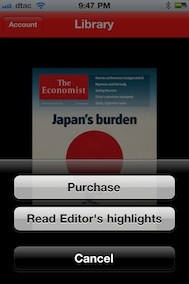 Interestingly the morning after arriving back in Bangkok, I saw notices for a couple of newly released apps for the iPad, one of which is pretty good on the iPhone too: Life; and The Economist. As they were available in the Thai online store, I downloaded both. Life joined my collection of iPad apps waiting for the off: New Yorker, and the local Mars Magazine (which has Thai content, not English). 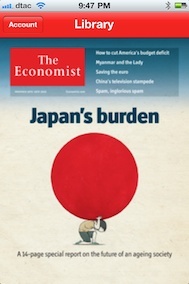 The Economist had an early morning test run. The management at The Economist are pretty shrewd and, although it is a publication with a traditional paper genesis, they have embraced technology quite successfully. Available online for a number of years, this is sometimes the only source for those of us in those countries which are sensitive about certain subjects. It is not unusual for the print version here not to be distributed, although I know nothing about those who subscribe by mail; so the normal resource is to look online and the item in question is usually there and probably has a greater circulation due to the interest promoted by the disappearance of the paper version. The online version does not contain the entire issue, and there are registrations and subscriptions for online use. 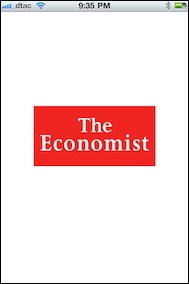 The Economist, therefore treads a delicate line between total control and open use: the former undesirable because this naturally limits readership; while the latter is also undesirable from the point of view of the publisher as there is no income, apart the limited advertising payments. That is stating the case simply, but I am not an economist, I am the other end: the user. 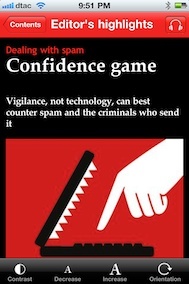 And in the execution of the new app the Economist have maintained that balance as well as brought to the App Store a cleanly developed app. Maybe this is something about the English as The Independent also made me happy with the way it is done. The Economist has a different type of approach and when first started we are asked to put in subscription details, register, or do none of the above. I did register for the Economist online a long time ago, but a number of computers later what the details are I (and perhaps the Economist) have forgotten. I will register again: this is worth it. What I do have access to right now is the "Editor's Highlights" and what a nice man he must be as what he allows me to look at may be quite enough for some people. My account (even though I am not registered) allows me to view some content for the current and previous editions and the way the covers are displayed, in a coverflow screen, means that the library will extend with time. Right now I have the current (20 Nov) and the previous (13 Nov) editions. 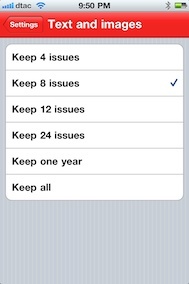 Settings are available for storing up to 24 issued, also with Keep One Year and Keep All. Tapping on a cover image brings up a half panel with three buttons: Purchase, Read Editor's Highlights, and Cancel. Pressing "Purchase" leads to another half panel with two choices (plus cancel) and we may buy a single edition for $5.99 or purchase a subscription. Note the price is in dollars. I chose the Editor's Highlights option for testing. My account gives me access to the Asia-Pacific regional edition and there are five others: Europe, Latin America, Middle East & Africa, North America and United Kingdom. Changing the region will delete the library and content will need to be downloaded again. We are informed that choosing a different edition will only affect the order in which stories are displayed. The cynic in me tells me that this is a subtle way in which content could also be trimmed to suit a specific region. I hope I am wrong. Accessing the current issue I selected "download" and both issues came down in a fairly quick time: Thailand does not have remarkably quick connections, particularly to the outside world, but this was workable. I was given a list of 6 articles plus "Preview full edition", which leads to a list indicating that there is considerably more of the content to come through the purchase option. At the top of each panel is an arrow button -- normal for this type of app -- that sends us forward to another panel of choices or back to the previous screen. These operated with no delay. Selecting an article revealed the item with a clear image. The text is underneath. Scrolling down reveals the article in black text on a white background. A Contrast button at the bottom will change this to white on black. Other icons are for reducing and increasing font size, giving 5 options, and an orientation lock. When this is not on, the items are viewable in landscape or portrait mode. This merely fixes the display in the desired mode. Scrolling sideways takes us to the next article, but every couple of pages, there is an advertisement (in the issues I saw these were from Shell and HSBC). Images are clear as one would expect. The last page has another offer to purchase the single issue or the subscription. 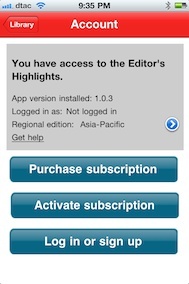 The digital subscription for Thailand is shown as $40 quarterly or $150 for a year. A print subscription varies by region and includes the digital option the figures displayed for me were $50 for 12 weeks and $230 for 51 weeks. A single issue online may be purchased for $5.99. At the top right of the Contents panel is a headphones icon. This also appears at the top of an article when opened. This allows download of a voice version which can be read with the text: a good way for learners of English to improve their skills. There is a short introduction by a female voice, then a male with fairly neutral British accent reads the text in a way that may appear slow to many but is crisp and accurate with the right pauses making this very easy to understand. At this stage I tried an experiment and had a shower with the soundtrack playing, although for the sake of safety put the iPhone under a towel. I could hear it fairly well most of the time, but at certain moments lost concentration, and lost sound completely when I soaped my ears. The running water of a shower may not be the best environment for this, but for those who take a bath this might be a way to catch up on articles. The audio articles were mostly in the region of 7 - 8 minutes in length, but there was one of around 11 minutes. When one is finished, the app automatically loads the next: great for a flight, rather than a bath, perhaps. Once the audio icon has been pressed, it to black and audio will continue through all articles. At the end of the 6 articles, the audio looped to the beginning and started again. To stop any audio (and the continuous play) I pressed the audio icon. It changed back to red and the sound stopped. The direction the Economist has taken here both for content and display suggests that a good deal of thinking has gone into the plan because what a reader/user wants most is minimum difficulty in access. There is just enough to please and tempt those interested to delve further (then pay), while to display and sound are both clear in their own ways to make reading or listening (or both together) an experience that is not a difficult task: something some content providers may not yet grasp. 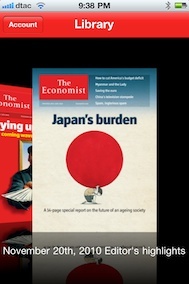 I find this a satisfying expression of the app-makers art merging technology with the Economist's interesting skill of reporting on the forces that act with economies. I am pleased with the limited screen display of the iPhone and would expect the iPad to make this far more digestible as text input. The trend is not just going to continue it is going to accelerate and the morning after posting the above look at the Economist app, there are strong rumours of a news-based app -- o paper edition, no web edition -- that is to be produced as a joint venture by Apple and NewsCorp. A full report by Edward Helmore of the UK Guardian about this development is available online.